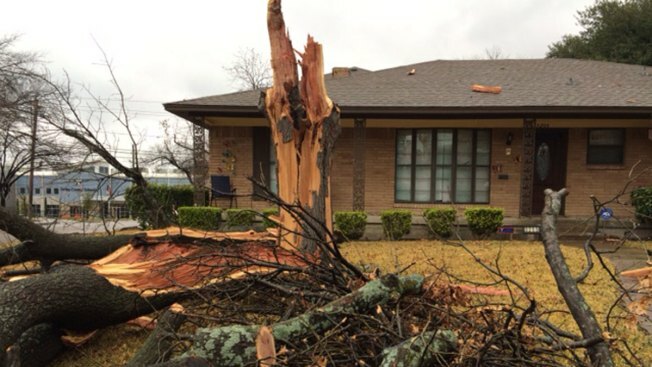 A lightning strike has taken out a large tree in East Dallas, even shattering the windows of a nearby home. The massive tree was hit at about 9:30 a.m. Thursday in the front yard of a house in the 5200 Enchanted Lane, near Samuell Boulevard. The homeowner said it sounded like an explosion, then all of the front windows of his home shattered. "I heard lightning and a big boom. It sounded like an explosion," said homeowner Alonso Guereca. "I came outside and I found this tree in the middle of the road by my house. It shattered all my front windows. It was pretty loud. I was scared. The tree split into several pieces. Guereca called 311 and city crews cut and cleared the tree within 30 minutes.